You respect, admire and get on well with your boss. You’ve rarely seen a more dedicated, impressive and productive worker. There’s just one problem – they expect the impossible from you on a daily basis. Relationships with managers come in all shapes and sizes. We’ve all heard horror stories of micromanaging tyrants, but some people have to face, dare I say it, an “over-eager” leader. They’re in early, leave late, and always available online. They move fast, talk fast, fizz with ideas, and have a never-ending wishlist of tasks and projects. When I spent time teaching English at a language school, my highly enthusiastic line manager was deeply unimpressed when many of my students didn’t re-sign up to my classes for the next semester. In vain, I tried to point out that those students had finished the most advanced course the school offered. Not good enough! I should have been such a good teacher that they signed up for the same class again. Over the course of our careers, we’ll experience many different types of leadership. A good boss is likely to respect your opinions, motivate you, and be a joy to work with. A bad boss might undermine you, fail to deliver on promises, and cause undue stress. 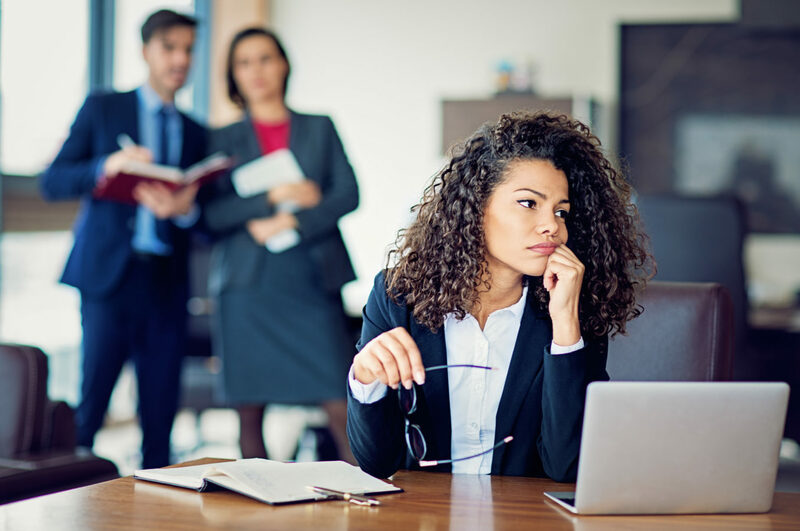 An over-eager boss, however, will behave a little like both: they may be respectful, but might also hold unrealistic expectations or give you an unmanageable workload. And when you’re not living up to expectations, it can have a detrimental effect on your work and self-esteem. Over-eager leaders can come in different flavors, too. Some may have unreasonably high expectations – they think you can handle an insurmountable workload or aren’t aware of how much you’re actually doing. And then there is the over-eager leader who never seems to sleep. They can do a hundred things at once and never tire or lose enthusiasm – the Thomas Edisons of this world. It can be hard to keep up with such an energetic co-worker, and if that person happens to be your boss, they might expect a subordinate to keep up with them. Both of these situations could lead to you feeling unworthy, anxious, forever rushed off your feet, or even bad at your job. How Do You Deal With The Over-Eager Leader? Normally in these types of relationship, no one is setting out to be cruel, abuse power, or underperform. Instead, there is a misalignment of expectation, communication and information. Long-term this can lead to burnout, resentment and stress. It goes without saying that bosses are the gateway to the next level of your career and getting these relationships right is essential for your professional progression. So how can you deal with an over-eager leader? Have you ever gone that extra mile in your role and all of a sudden had the dawning realization that no one will know? You could have spent less time working and you’d still have done all your tasks and no one would have been any the wiser. It’s a frustrating, demotivating feeling that many people know all too well. Worse still, if work on even your main tasks and duties has gone unnoticed, your manager might think that you are underperforming. “But I’ve done so much!” you scream in your head, resentment boiling over. But managers aren’t mind readers. They’ve probably got a million other things going on, so it’s important to establish good lines of communication to make sure that you are both fully informed. Find channels to present evidence of what you’ve done. For example, keeping time-sheets of your work or arranging regular informal catch-up meetings are great ways to start improving communication. Essentially, find ways to show them how you work! There was a time when the thought of approaching my manager in this way would have filled me with dread. If that sounds familiar, you can work on building your confidence first. Once gained, this confidence will snowball into an ability to better cope with difficulty. If you’re worried about not being clear with your intentions when you approach your boss, The 7 Cs of Communication is the perfect tool to get your message ordered and logical before taking any action. Once good communication is established you can then identify areas of friction and work on them. But maybe the truth is that you are struggling to keep up. You appear to be working for the Usain Bolt of management and, ultimately, you’ll never meet their expectations. In this situation, honesty is crucial. If you are falling behind, it’s OK to say so. Some people think the world will end if they admit to their faults but in fact this is one of the best ways to address them. Being up front in this way can even enhance your reputation as a trustworthy team member. Re-establish exactly what your responsibilities are, and what’s expected of you on a daily or weekly basis. Stand up to unreasonable requests and make it clear that your work is at its best when it’s manageable. It might be tempting to avoid these difficult conversations; it’s true that you might be able to force yourself to keep up with the breakneck pace for a few months or even a few years, but your work won’t be at its best and there’s also a chance of running headlong into a breakdown. If your manager understands that, it could change their perception of the situation. Building trust is critical for a good working relationship. The science behind the benefits of trust is staggering. Businesses with high levels of trust are generally more productive, energetic and innovative. According to one study, there’s a direct correlation between trust levels, staff turnover and profit. And, believe it or not, trust is contagious! I’ve heard bitter tales from friends with bosses who watch them like hawks, hovering around them, double-checking all their work. Behavior like that benefits no-one. Everyone’s time is wasted and any drive or sense of pride in the work is completely extinguished. To some extent, it’s true that you’re there to make the boss look good. And if your boss doesn’t trust you to meet expectations, or you don’t trust your boss, then the relationship and work will suffer. When trust is lost, remember it will take time to rebuild. When my boss at the language school saw that I was working hard and that many students were fond of my classes, she began to ease up on her initial draconian punishments, which had involved working Saturdays and with the difficult kids! Showing interest in your manager, by remembering their birthday or asking how their weekend went, will help form a closer relationship too. Just make sure you don’t cross the line into inappropriate behavior! The Johari Window is a great tool for building trust as well as self-awareness and better working relationships. At my language school there was a misalignment of expectation. People naturally begin to form unspecified expectations when taking on a role, and when the unspoken contract of expected behavior is broken, workers can lose trust in their boss and organization, just as I did with my school. If you are keeping up with what you believe to be reasonable, but your boss is expecting more, remember that expectations can’t be met if people don’t know what they are. Make your case and show how you’re doing your job effectively and successfully. Always try to keep your boss in the loop. Remember, in this situation, it’s neither you nor your manager who needs to change: it’s the relationship. If, however, you happen to be working for Superman, and it’s not possible to keep up, you’ll need to adjust your manager’s expectations. This will take a potentially difficult conversation, but afterward, through continued honest dialogue and the rebuilding of trust, you’ll be able to thrive. When the workload has decreased, or expectations are clearer, you’ll be able to put your energy to good use without the fear of burnout, poor work output, or missed deadlines. Heck, you may even find that you begin to excel! Have you ever worked for an over-eager leader? Let us know how you dealt with the situation in the Comments section below. Thanks for sharing this very important leadership clues – dealing with over eager leader. In my view, it is not bad if a leader demands his/her followers. What most important is building collective consunsus on realstic objectives. Such leaders should also strongly note that performance is the functiions of three fsctors: the leader, the follower and the environment in which the leader and folowers operate. So that, such leaders should make sure conducive working environment as well as closely listen to their team and adress concerns as much as possible.